Much like bush tucker trials that Snake has to sample during his virtuous mission, Metal Gear Solid: Snake Eater 3D is an acquired taste. Squashed, pruned, and roughly fitted onto the Nintendo 3DS hardware, the most fatal shortcoming in Metal Gear Solid: Snake Eater 3D might be the fact it hits shelves just weeks after the comparably priced trifecta, the Metal Gear Solid HD Collection, but it’s Hideo Kojima’s masterful game design that lives on within the tiniest of cartridges. 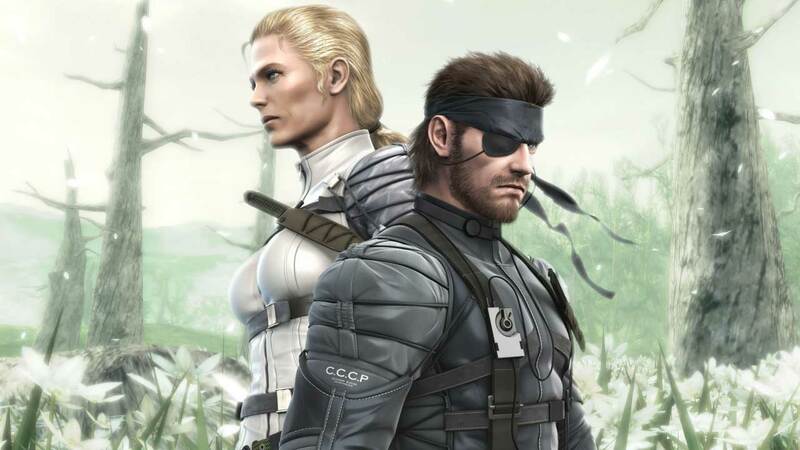 Set during the Cold War era, you play as Naked Snake, a skilled operative who must become one with nature as he rummages through the wild jungles of Soviet Russia to recover a scientist working on a mobile nuclear missile launcher. Those familiar with other entries in the Metal Gear Solid series will be familiar with the hide-and-seek games you play with GRU forces patrolling each area, but Metal Gear Solid: Snake Eater 3D has more thoughtful systems in place. Regularly changing costumes in order to blend effectively with your environment, preying and feasting on the jungle’s platter of exotic ingredients to keep your stamina in check, and treating your battle wounds with immediacy become paramount exercises in survival. Juggling these variables can seem likes a chore from the outset, but maintenance of Snake quickly becomes its own reward when you manage to avoid detection from a guard stood inches away and do battle with the Cobra Unit, an oddball bunch that comprise the boss encounters in Metal Gear Solid: Snake Eater 3D. You’ll never land a shot on the agile and limbered ‘The Fear’ if you’re running on an empty stomach, and a sniper duel against an aging pro can be won and lost on your ability to engulf yourself in the wildlife, pick out the slightest tells, and endure what is one of gaming’s most memorable encounters. The fact that you can fast forward your handheld’s clock a week and return to this battle to find your opponent has died of old age is just one of the many amazing touches Kojima has woven into his masterpiece. Discovering the others becomes an obsession over multiple playthroughs. So it’s a good game. the vibrant cast in Metal Gear Solid: Snake Eater 3D, unforgettable boss encounters, emotive revelations, and baffling intricacies prove themselves to be timeless examples of Kojima’s brilliance, even when experienced through a 3.5-inch auto-stereoscopic 3D display with a miserable frame rate. But it’s the port as a whole that doesn’t quite meet the impeccable standard. Some shortcomings are unavoidable. Spanning around 18 hours, Kojima’s heavy-handed script is littered with lengthy dialogue, detailed back histories, and elaborate cut-scenes which are a poor fit for a handheld whose battery lasts roughly a couple of hours. In addition to a power supply, investing in the Circle Pad Pro peripheral is recommended. There’s plenty of option and cumbersome presets to play around with but as other portable entries in the series have reinforced, twin stick control is how Metal Gear Solid should be played. The touchscreen doubles as a rather convenient map and HUD display with shortcut icons allowing you to jump into your available meals, first aid items, and a closet of disguises. Fans may feel a little short-changed to see none of the extras from the highly sought after Subsistence directors cut made it into the 3DS version. There are, however, some thoughtful gimmicks. Narrow passageways employ the use of the gyro sensor in a pointless balancing act and an optional camouflage creator takes your photo album into new jungle attire with both hilarious and surprisingly useful results. And that really sums it up. Metal Gear Solid: Snake Eater 3D is a middling port of an exceptional game: a prime steak served with a side of tree frogs and twigs. It’s hard to recommend this version when you can pick up the Metal Gear Solid HD Collection on consoles and experience Snake Eater and two other chapters of the saga all running at silky smooth frame rates, in high definition, with all the trimmings, for the same price. Like the creatures Snake feasts on during his virtuous mission, Metal Gear Solid: Snake Eater 3D is a delicacy that few will sample. Those with limited options, however, should take the plunge and tuck in.